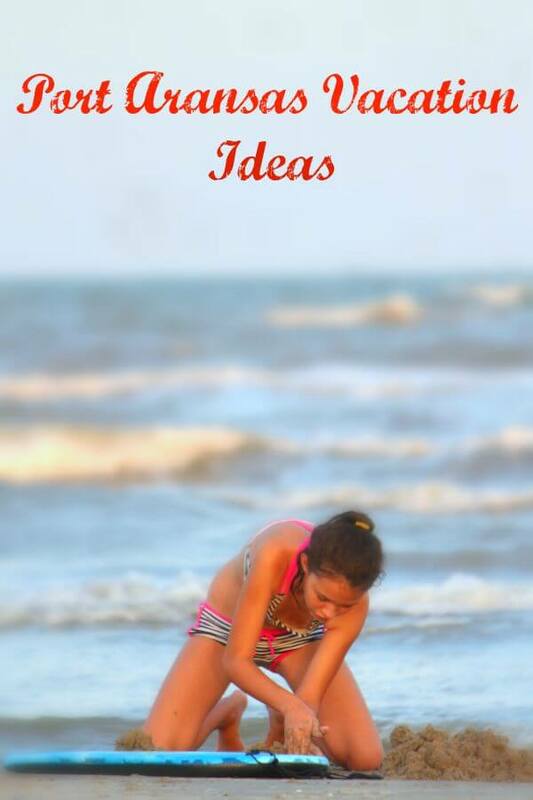 Wondering about Port Aransas Vacation Ideas? We spent a week in Port Aransas, Texas in a rented condo in July. 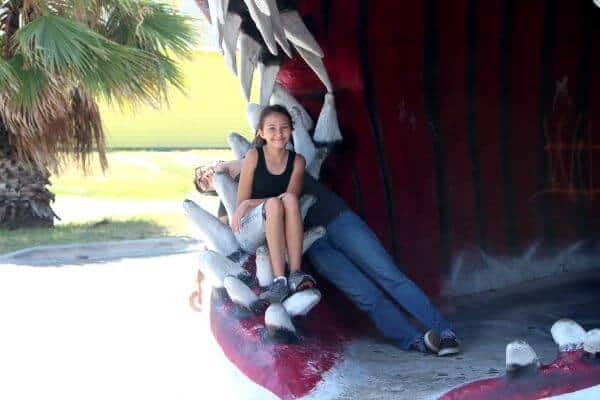 It was an amazing time of family fun and relaxation – and I learned a bit about what to do in Port Aransas! ANYWAY, I prefer second floor because it’s quieter and I hoped for a good view of the ocean from the balcony. Funny thing was that I had the view but I only went out there twice! I was surprised that the kitchen was so well equipped – it even had a coffee grinder and a crockpot. With six of us I figure we saved roughly $150 a day in food costs by being able to cook our own meals. The condo also has three big televisions, iffy cable, WIFI, and lots of videos. One thing about me is that I am a morning person when I am allowed to be. I mean I can’t get up early when my husband has worked until midnight or we’ve been out late but under optimum circumstances I like getting up to watch the sun come up. I was out of bed by 6:30 most mornings and walked the beach while I had my quiet time. I chose to walk to Horace Caldwell Pier and back, which was about 3.5 miles round trip. Great for me since I was eating vacation style and not going to the gym! Morning on the beach is special, I think. The crashing of the waves and the cries of the gulls create a sort of solitude all around you. 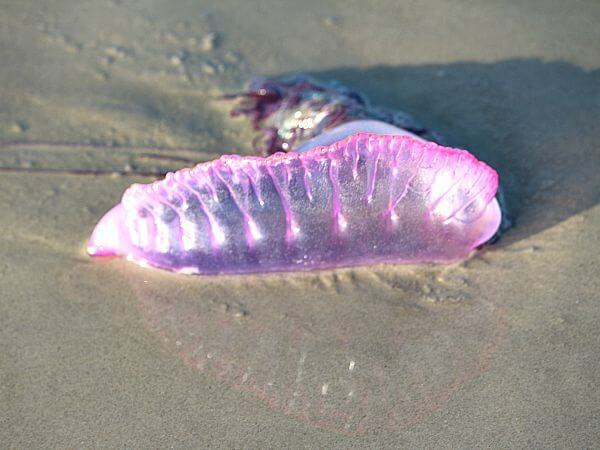 Nearly each morning I was there I came across Portuguese Man-O-Wars on the beach, and one time I saw one in the water. I’d never seen them before, and I don’t know if storms at sea brought them in so close to the beach, but they are gorgeous — even if they are dangerous! They have a nasty sting and they can sting you even after they are dead if the tentacles still have the stuff. I tried to tell a couple who was trying to put one back in the water but they wouldn’t listen. I am certainly a believer in mercy for animals but returning a dangerous creature into the water where children are playing is just stupid… plus it was on the beach because it was dying. The kids had a great time building sand castles and playing in the surf. The youngest two, 12 and 15, had more fun than the older two. We didn’t spend all day on the beach. I can’t handle that much sun and the kids lost interest. So, we’d go to the beach for the morning then have lunch at the condo, clean up, and head into town. There are a lot of cool places to shop but you should be aware that almost all of them have the same, exact stuff. It’s kind of a waste of time to go in ALL of them. 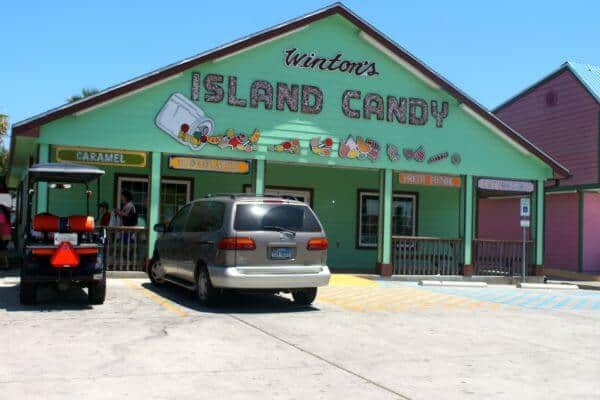 One place you’ll want to go is the Winton’s Island Candy Store. They’ve got candy of every kind — it’s unbelievable! They’ve got salt water taffy (the buttered popcorn flavor was my favorite), chocolates, an entire wall of licorice, and all kinds of fudge and caramels that they make in house. You get a bag and just fill it up with what you want. We did eat out a couple of different times — twice as a family and the last night when my husband and I had a more or less romantic dinner. The first night we were there we went to Fin’s Grill and Icehouse. I ordered the Coconut Rum Shrimp platter which was 20.99 but hey, I was on vacation so what the hell, right? Honestly it was OK. I thought that it was kind of bland and tasteless but it could have been that my expectations were just too high. The batter was too thick for the shrimp and the shrimp was huge but not seasoned much. So, while they come highly recommended by the “locals” I personally would suggest finding somewhere else. We always have pizza on Friday nights so we decided to maintain the tradition on vacation. The most popular pizza spot in Port Aransas is Port A Pizza. They have a pizza buffet and a salad bar, plus (to my youngest daughter’s delight) a soft serve ice cream dispenser. The pizza is really good with a nice crust and tangy sauce. The toppings are super generous. The thing is if you are going to go, at least on a Friday, be prepared to wait. Let me just say that Be prepared to wait should be your mantra while you are on your Port Aransas Vacation! The summer is the height of tourist season and there are crowds everywhere. Some of the nicer restaurants are booked months in advance and sometimes there is up to a two hour wait at others. Even the line at the ice cream place took 10 minutes to get through! On the last night my husband and I went to Seafood and Spaghetti Works. I wasn’t expecting it to be wonderful but it was… I guess maybe I am a name snob! Anyway when we got there the wait was 45 minutes so we put our name on the list and walked over to one of the stores to pick up a memento for our 15 year old who hadn’t gotten anything because “I don’t want to spend all your money”. My kids are very considerate about spending money but sometimes I wish they’d just relax a little, you know? Anyway when we got back we still had a few minutes to wait but people who were just coming in were told that the wait list was two hours long! I grabbed a chair at the bar and had a spicy habanero mango margarita while we were waiting. I ordered crab cakes and a mango -colada. The salad bar was really good and they had chicken enchilada soup that was “almost” as good as mine. At least I think it was chicken enchilada soup! My husband’s steak was perfect with a smoky, caramelized crust and cooked a perfect medium. This is one place you definitely want to go. I was surprised when we pulled up and I saw the long line that snaked out the screen door but if you are going to Desserted Island Ice Cream then you are going to stand in line. I had the mango ice cream and it was rich, creamy, and delicious. They normally serve Blue Bell but have changed to some other (unknown by me) brand until Blue Bell is available again. The inside dining room is small but there are a few picnic tables on the deck where you can enjoy your ice cream and people watch. Yes, that is a huge (concrete) shark! The kids loved goofing around! 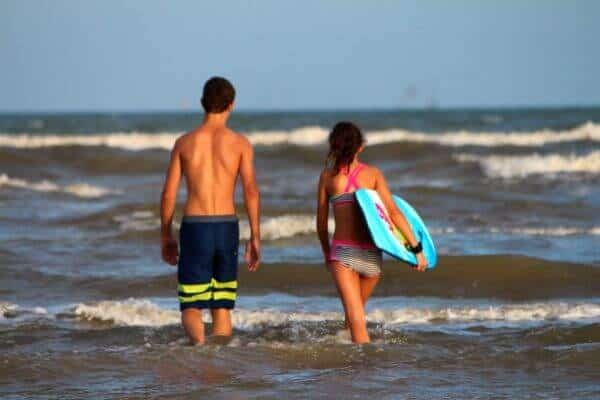 If you are looking for a vacation with a wild nightlife and lots of places to shop then Port Aransas probably isn’t your best bet. However, if you are looking for a relaxing, low stress, family vacation where you can spend a lot of time on the beach then this is the perfect spot! During the week the beaches were not crowded at all but once Saturday hit it seemed like everyone in Texas headed there. I’d suggest renting your condo from Sunday night through Saturday night like we did. The beaches were clear for the first several days we were there and by the time they got crowded on the weekend we were ready to leave anyway. I saw a lot of people who had bought canvas pavilions for the beach. It allowed them to bring their coolers, card table, chairs, and everything out on the beach and stay all day because they were protected from the sun. If you plan on spending the entire day on the beach then definitely invest in one of them. They aren’t that expensive. We roughed it and I am still peeling from the sunburn I got. My own fault — I told my husband we didn’t need it. I can’t possibly get all of my vacation pictures here without really loading down the page and causing it to be slow but you can see them in my facebook vacation album if you want.